Let meeting attendees know you're running late from the calendar card. 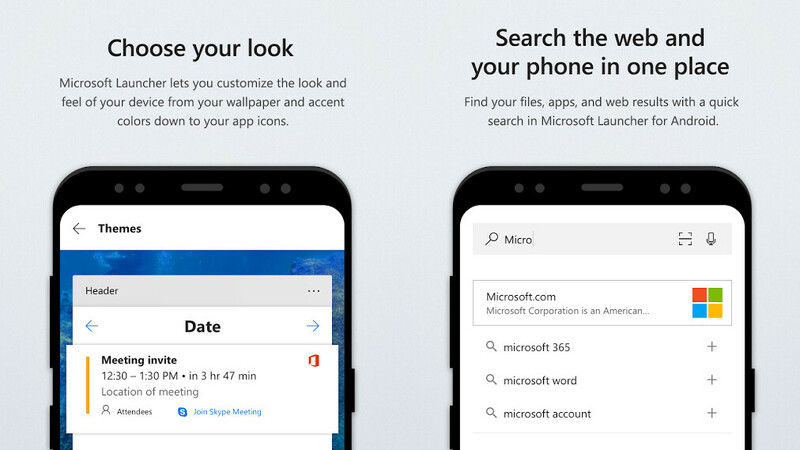 Employees whose enterprises leverage Microsoft Intune's data protection policies can now use the Microsoft Launcher for viewing corporate data. Adjust icon size in the app drawer, dock and home screen. In an expected bid to push Bing, Microsoft has also added a new "Trending on Bing" section when accessing the launcher's search interface. It's somewhat similar to the "My feed" tab in Microsoft Edge, in that it is a sort of a news feed containing stories on popular topics, which, of course, redirect users to Bing when tapped. Seems like the manpower that once worked on Windows 10 Mobile is now onto Microsoft Apps and the launcher for Android. The Microsoft Launcher (Formerly known as Arrow Launcher) has received over half a dozen updates in the past six months! Just wish they keep it relatively minimalistic as you can now do TONS of stuff on the launcher like take down notes, set reminders, make a checklist, read your news feed and so on which is a tad... Shall I say; too much? But then again, one can always get Apex or Nova. G'Day! I'd say that Microsoft launcher is pretty minimalistic while at the same time being feature rich and I like it that way. A launcher better than stock and Nova.